Cisco® has a successful track record with both enterprises using managed services and services providers offering managed services. This document provides an overview of the key challenges and solutions for the high-end enterprise using managed services. Service providers have offered their business customers managed services for broadband connections, VPNs, security services, and IP communications for years. These services are attractive to smaller businesses that do not have dedicated IT resources. Larger businesses have dedicated IT staff and usually purchase only broadband connections from service providers. Recently large businesses are realizing their IT staff is a valuable strategic resource that they can use to improve profits in many ways. However, the IT staff is often allocated to running the network and maintaining the equipment to support the network and the employees. One way to free the IT staff is to outsource some of the network operation and take advantage of managed services. 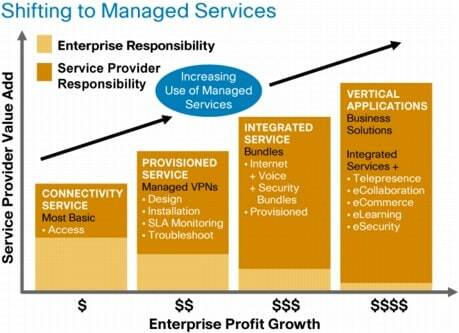 Figure 1 shows how enterprises can reduce costs of running their network by using managed services. The shift to managed services is especially challenging for the high-end enterprise because managed services entail additional complexities. The following sections explore some of the unique challenges large enterprises need to address while shifting to managed services. • VPNs that tunnel the enterprise's traffic over the shared network from the service provider: The VPN is dedicated to the enterprise, and it can be customized in a variety of ways to meet the needs of the enterprise. VPNs can extend out to remote employees, and they can be secured from unauthorized access. The performance of the VPN and the priority of the traffic carried by the VPN are specified in the service-level agreement (SLA) between the enterprise and the service provider. • Security services that include firewalls to protect internal addressing, control access to enterprise resources, authenticate users of the enterprise network, and control access to router ports: Most security services also include monitoring for intrusions to the enterprise network and preventing intruders from accessing the network. Additionally, the service provider offers vulnerability assessments and up-to-date information about protecting the enterprise network. • IP communications for voice, multimedia, and collaboration inside and outside the enterprise: Call processing, unified messaging, presence, video communications, collaboration, mobility, and soft clients are included in this service. Figure 2 shows how these basic services support more advanced services such as collaboration and shared business applications. The figure also shows the typical large enterprise places in the network: headquarters, branch office, and remote access. In summary, a managed service is an IT service such as broadband, VPN, security service, or IP communications that a service provider offers an enterprise in compliance with a SLA. The following sections discuss some of the challenges for an enterprise in using managed services. Additionally, the enterprise network elements are deployed globally. 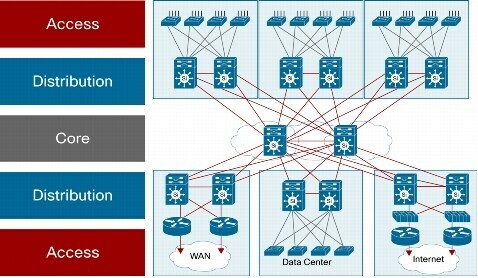 Figure 3 shows a typical high-end enterprise campus network that is deployed in the headquarters or large regional office. Managed services from the service provider come in through the WAN or the Internet. Some high-capacity data-center services such as storage area networks have dedicated Fiber Channel access to transfer huge amounts of data quickly. 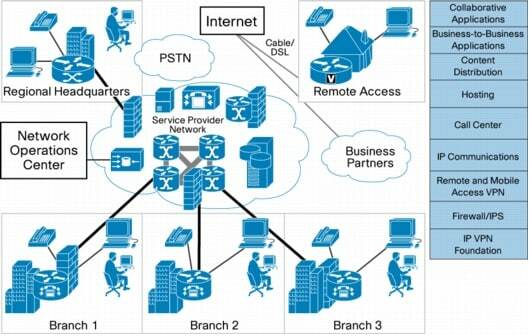 Figure 4 shows the wide variety of branch offices that the enterprise IT staff has to manage remotely. Often these branches are located in a different country from the headquarters. For both diversity and cost savings, the enterprise uses multiple service providers for WAN connectivity and managed services. Employees in the branch offices need to have the same IP communications services and collaboration tools as the employees in the headquarters office. The branch-office employees also need access to corporate resources in the data center. Finally, because the branches are sending and receiving traffic over service provider networks, access security and data encryption are needed to prevent unauthorized use and protect confidential information. Figure 5 shows the WAN that connects the headquarters to the branch offices. In addition to traditional leased lines, enterprises use Frame Relay, ATM, and IP/Multiprotocol Label Switching (MPLS) to transport their traffic. Table 1 summarizes some of the different WAN transport options. Ethernet and IP/MPLS technology usage is increasing, but in many locations leased line, ATM, or Frame Relay are the only options for WAN transport. Table 1 shows many advantages of Ethernet over Frame Relay and ATM, but switching over to Ethernet incurs expense from tight budgets to provide the equivalent transport capabilities. However, for the enterprise that uses managed services from a service provider, the transport technology is less relevant to the network infrastructure. With a managed broadband service, the service provider can gracefully migrate the WAN transport to the higher-bandwidth Ethernet option. The migration to Ethernet is a key step for high-end enterprises to take toward consistent managed-service capabilities in their global infrastructure. Because of the work of global standards bodies such as IETF, IEEE, ITU, and Metro Ethernet Forum (MEF), Ethernet services are evolving into ubiquitous offerings that network engineering teams understand. VPNs services on top of the WAN transport can deliver further network service consistency for enterprises. VPNs provide tunnels between the different sites in enterprise networks, and they provide a tunnel from the remote employee to the enterprise. VPNs can be point-to-point, routed, or encrypted. With the VPN service, the enterprise has a standards-based toolkit to efficiently move traffic around the global enterprise. Further, the VPN service allows traffic to be classified and handled in a manner that best meets the needs of the enterprise. What Is a Managed VPN Service and How Does It Benefit Enterprises? When an enterprise uses a shared network to carry its traffic, the enterprise IT staff needs to be sure the traffic is delivered properly and without delay. Further, to comply with regulatory requirements and confidentiality requirements, the traffic must be segregated and often encrypted as it passes over the shared service provider network. The enterprise can chose to either manage the CPE or customer edge (CE) or allow the service provider to manage the CPE or customer edge. The network element at the edge of the service provider's network is called the provider edge (PE). Figure 6 shows this arrangement. Enterprises and service providers can use a few types of VPNs and configuration settings to meet the requirements of the high-end enterprise. Figure 7 shows the three basic kinds of VPN services. These example VPN configurations do not include support for encryption; they are simply ways to tunnel the enterprise data to and from the remote sites. Most large enterprises require encryption of some or all of their traffic crossing a shared network. They configure and manage basic encryption with IP Security (IPsec) on a point-to-point basis. Until recently these three types of VPNs were the only choices for enterprises to select for managed VPN service. However, these VPNs missed some key requirements such as enterprise network access from remote employees, support for multipoint encryption, and multicast support for multimedia support. Plus, for a large enterprise with hundreds of remote sites, management of the encrypted tunnels is a fairly complex task. • Remote VPN using SSL: This VPN provides secure access for remote employees to the enterprise network and resources. 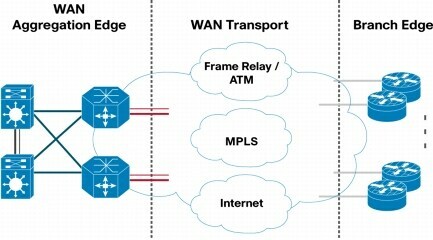 Figure 8 shows how the remote employee's tunnel is carried transparently across the service provider's IP/MPLS network. • Dynamic Multipoint VPN (DMVPN): This new type of VPN provides multipoint connections over an encrypted VPN. Note that standard encrypted VPNs can provide only point-to-point links. Figure 9 shows the additional dynamic encrypted tunnels that can be deployed with DMVPN. • Group Encrypted Transport VPN (GETVPN): This type of VPN provides automatic allocation of encrypted tunnels for any-to-any connections. Additionally, multimedia applications such as Telepresence and video that require a multicast network are supported with packet replication. You can see the benefits of GETVPN by comparing GETVPN to a traditional encrypted VPN network in Figure 10. 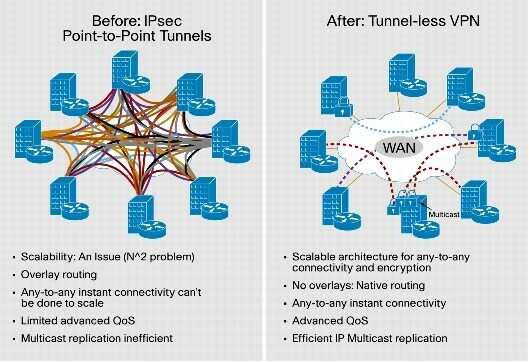 When the enterprise starts tunneling the traffic among its sites, two other key requirements surface: segregating latency-sensitive traffic such as voice to provide quality of service (QoS) and multiple virtual routers for separate VPNs to connect the branch locations (Virtual Route Forwarding [VRF]). QoS is usually managed with three, four, or five classes of service. 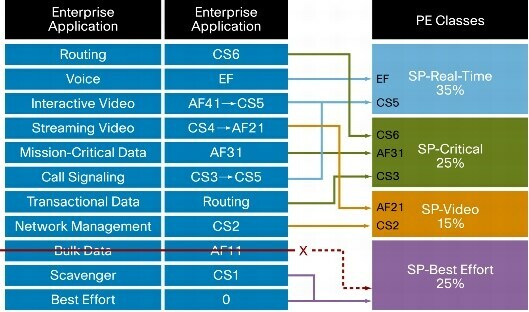 The enterprise selects which kind of traffic is assigned to which class of service. The managed routers at each site must classify the traffic into appropriate classes of service. Note that the core routers in the service provider network expect the traffic to already be classified when it reaches them. Traffic is classified in the router using differentiated services code point (DSCP). Figure 11 shows an example of the classification of router traffic into four classes. It is important that latency-sensitive traffic such as voice and video is handled before best-effort traffic such as Webpage downloads. The enterprise IT staff must be able to provide clear voice services to campus and branch-office employees. Therefore, the QoS parameters and contracted service levels are documented in the SLA between the enterprise and service provider. Additionally, large branch offices have local routing requirements to segregate guest and partner traffic from that of the employees. Guests, partners, and employees also have different access privileges. Therefore, large branch offices need VPNs local to the branch, and these VPNs need to be carried over the service provider's network. The ability for a CPE to route traffic from multiple VPNs locally and across the service provider's network is called multiple VRF (multi-VRF). Figure 12 shows the value of this capability in a large enterprise. Is an Encrypted VPN Enough Security? After the physical network access is in place and the VPN service is established among the sites, the next area to address is security services. The most important on-premises security service for the large enterprise is firewall protection to hide internal addresses and control access to internal resources. The first level of firewall protection is to hide internal addressing -- otherwise known as obfuscation -- using Network Address Translation (NAT). Obfuscation prevents external attackers from guessing internal addresses and attempting to access addressing devices. The next step is to control who can access what resource. Typically enterprise networks are divided into different zones, each with a different security level, so, for example, the inside of the network has the highest security level and the Internet the lowest security level. A typical firewall policy allows connections initiated from the inside of the network to the Internet, but not conversely. Users from both the inside network and the Internet should be able to access Web servers that sit on the DMZ, or network perimeter, which has a "medium" security level, that is, lower than the inside network but higher than the Internet. The DMZ should therefore not be able to initiate connections to the inside network. With this policy, then how does the return traffic get from the Internet to the inside network? A "stateful" firewall controls this traffic -- return traffic is allowed in only if an established connection is initiated from the inside network. You can add stronger security by authenticating users and limiting their access -- one application would be split-tunnelling, whereby only authenticated users can gain access to the corporate network. Firewalls typically control the number of connections for a range of protocols. With protocol connections limits, access to resources can be limited, providing protection from denial-of-service (DoS) attacks. Firewalls can also control which ports are allowed. Adding firewalls to stateful access control allows you to limit Web traffic. For example, port 80 can be opened between an inside host and a Web server for only a limited time. The trend for firewalls today is in the direction of application firewalling, whereby there is deeper inspection into the packet to glean information about what is happening at the application level. For example, a firewall can inspect and control HTTP traffic, so that browsing Webpages is allowed but HTTP POST packets are blocked (POST packets are used to post data to insecure and untrusted servers). How Can Managed Services Be Cheaper Than a Self-Managed Network? Cisco has much information about the savings that you can obtain from managed services. Please refer to the references for links to relevant information. An example scenario has a midsize financial services firm with 2000 employees, 1000 of which work at its headquarters. The rest of the employees are distributed across 49 branch offices, averaging 20 employees in each office. These remote locations are small branch offices with financial specialists in each, and no IT capabilities at all. A managed-services solution brings headquarters-style applications, and the security of knowing that the applications and network run correctly. Without a managed-services solution, fixing problems could require travel. 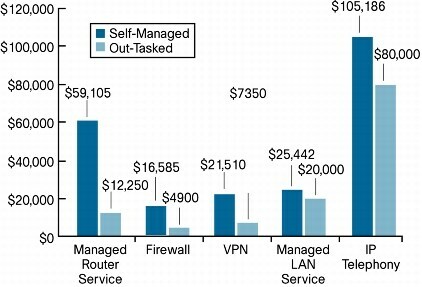 The distributed routers, firewalls, and VPN sites are costly for the enterprise in this scenario to manage, given the number of network elements per employee. In this scenario, the financial services company can reduce its costs by more than 40 percent by shifting to managed services. This case shows the benefit of managed services in the branch-office environment. These offices generally serve a smaller number of employees, and keeping IT resources in the office is often not economically feasible. Also, these offices are geographically dispersed, so problems require remote diagnosis and in the worst case, travel to resolve the problem. Figure 13 shows the monthly savings for this scenario. Finally, using network equipment that meets the requirements of the high-end enterprise is mandatory for successful migration and usage of managed services. Cisco 7200 Series Routers extend services aggregation to enterprises and redefine best-in-class routing for secure, concurrent delivery of data, voice, and video. As enterprises expand globally while simultaneously integrating a new wave of applications, the WAN edge has become a critical gateway for business success. The Cisco ASR 1000 Series Aggregation Services Routers are ground-breaking routers that represent a dramatic advance in technology innovation based on Cisco's understanding of evolving customer requirements. These routers set new expectations for industry-leading performance and scalability of embedded services atop a secure, resilient hardware and software architecture. The Cisco ASR 1000 Series Routers have been crafted to meet and exceed the most exacting standards that rapidly evolving enterprise business requirements can demand. Migrating from a self-managed network to managed services saves operational costs for large enterprises. When the managed services provider is experienced with the challenges of enterprises with multiple campuses, hundred of branches, and remote employees, the IT staff is freed to generate new profits for the enterprise. Installing a proven, scalable, and reliable router platform is required to use secure managed WAN services. Investing in a Cisco router platform implements the managed-services infrastructure that meets today's demands as well as future service demands. Service providers that display the Cisco Powered logo can help enterprises migrate to MPLS-based VPN services. These providers have earned the Cisco Powered designation by maintaining high levels of network quality and by basing their VPN services on Cisco equipment. An increasing number of Cisco Powered providers have earned the QoS Certification for VPN services, meaning that they have been assessed by a third party for the ability of their SLAs to support real-time voice and video traffic, and for their use of Cisco best practices for QoS. Nearly 400 of the most successful service providers throughout the world offer services that have earned the Cisco Powered designation. These providers offer services such as Internet access and Web hosting as well as IP communications and multiservice VPNs. You are now logged into ManageEngine On-Demand. Proceed to one of the applications from below. ManageEngine On-Demand offers online web applications for businesses to manage their IT infrastructure. Hosted in secure, tier-III data centers, the applications completely eliminate the burden of installing and maintaining complex hardware and software to manage the IT infrastructure.The SaaS powered capabilities of ManageEngine On-Demand helps IT teams focus on their first priority : to learn and adopt new, relevant technologies to increase business productivity and profits. Manage your IT help desk requests effectively. Features include self-service portal, knowledge base, auto routing of requests, notifications, SLA management, email integration, custom request form, user survey, multi-site support and help desk reporting. Flexibility to customize the application to provide optimal results in tune with your current IT processes. Manage and track all the assets in your organization, in addition to help desk. Features include integrated asset management, purchase management, contracts management, software compliance, license tracking and asset reports. If you follow ITIL, make use of out-of-the-box workflows to implement incident, problem, change and release management with CMDB. Site24x7 is a cloud infrastructure monitoring service (SaaS) that helps monitor the uptime and performance of servers, applications and websites. It also supports monitoring the end user experience from a global perspective by monitoring from over 40+ locations around the world. Monitor critical servers and applications using our agent based server monitoring capabilities. This helps you track performance of servers and network services behind your firewall with a cloud friendly architecture. Site24x7 APM Insight can help DevOps teams to gain visibility in to slow Java, .NET and Ruby on Rails applications. It provides in-depth application performance monitoring and troubleshooting capabilities for production applications, as a service, making it easy to deploy and get started.